Batsford Cottage in Willicote, near Stratford-upon-Avon sleeps 4 people. 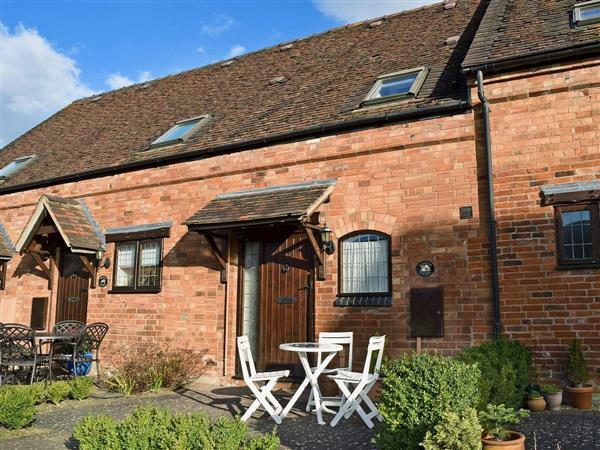 This delightful holiday cottage in a private courtyard offers bright, well-presented accommodation just 4 miles from historic Stratford-upon-Avon, birthplace of William Shakespeare. Set in the beautiful Warwickshire countryside, it offers cosy cottage accommodation with its own patio/garden. The honeypot Cotswold villages of Chipping Campden, Broadway and Stow-on-the-Wold are nearby. Warwick, with its famous castle, is within easy driving distance. This beautiful cottage is ideally positioned to enjoy all this area has to offer. Shop, restaurant and pub 2 miles. Ground floor: Living room with patio doors/dining room/kitchen with tiled floor. First floor: 2 bedrooms: 1 double, 1 twin, both with Velux. Bathroom with shower over bath and toilet. Night Storage Heating,electric, bed linen and towels included.Parking (1 car). Video. DVD. Electric cooker. Microwave. Washer/dryer. Dish washer. Patio and furniture. Shared use of 15-acres of natural grounds. Shared Barbeque. Welcome pack. No smoking please. Holidays at Batsford Cottage run from Saturday to Saturday. For a better idea of where Batsford Cottage is, you can see Batsford Cottage on the map below. Batsford Cottage is in Warwickshire; should you be on the lookout for a special offer, you can find all the special offers in Warwickshire. It's always worth checking to see what is on offer at the moment. Do you want to holiday near Batsford Cottage (RCHT13), you can see other cottages within 25 miles of Batsford Cottage; have a look to find your perfect holiday location.